Water is large part of many people’s lives in Congo. Every day, people wake up early to go to the nearest water source, often many miles away. This is especially the case for women and girls. Usually water is collected from a stream or river with murky but flowing water. Many communities have built small reservoirs in an attempt to make the water collection process easier, but this water is rarely clean. Animals use the water source, too, and spread disease. People sometimes bathe in the water source, not realizing they are contaminating the drinking water. 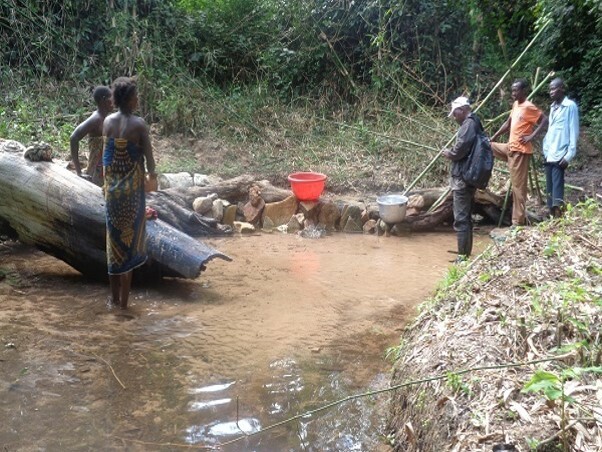 Most of the communities supported by the Congo Clinic Initiative have no access to clean drinking water, despite an abundance of rivers, marshes, and natural springs. Over the last few decades, there have been attempts to install wells and water purification systems in a limited number of villages, but these installations tend to break down and go unrepaired. Only springs coming from deep enough underground can provide clean drinking water, and this water is quickly contaminated once it reaches the surface. For these springs to provide clean, usable water, they need to be capped. This involves building a platform over the spring to harness its pressure and channel clean water through pipes. PCP believes that the best way to achieve clean water is by working through our local partners and with communities to identify problems and possible solutions. Through organized community meetings, Jacques Lomande (PCP’s regional manager) and the village clinic staff are working with a delegation from the village that includes women, youth, religious leaders, and other representatives to discuss, teach, and assess the primary causes of health problems. 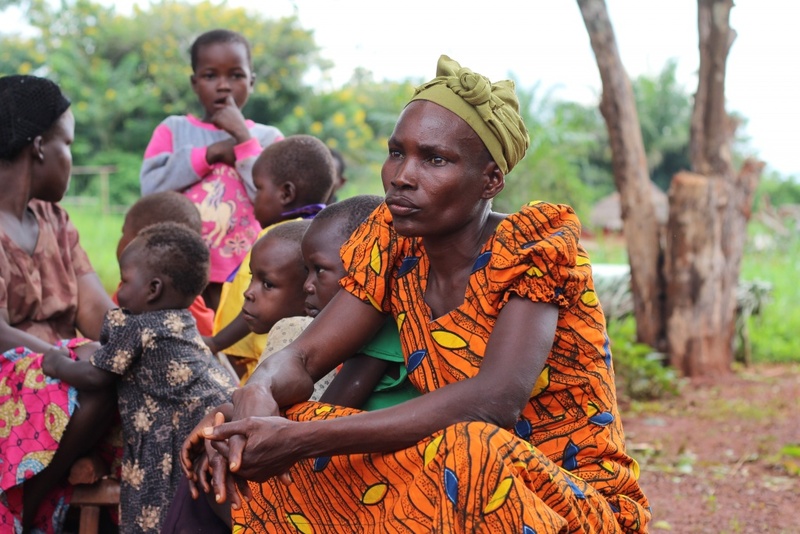 In a recent meeting, many of the women quickly realized that the water they drink was causing serious health problems, especially for their children. After a bit of resistance from the men, some of the women said, “If you could see what you drink, you wouldn’t be drinking it!” Since then, they’ve spent time together at the water source. We were able to arrange for a water technician from a nearby town to help them assess their water source and highlight possible solutions. Already, community members are discussing things that they can do on their own to improve their village’s water source! We love the tangible impact that many of these projects have. However, we realize that the intangibles are often more important! Even the best installation will eventually crumble if it isn’t valued and owned by the people who depend on it. By working through local leadership and with community members, we believe that these water projects will be of much more use to the communities we serve. These community meetings will be piloted over the next few months in five villages. As the Congo Clinic Initiative moves into year 3, we will begin to roll out community water projects throughout the region, taking what is learned from this pilot phase and applying it broadly. We rejoice in the progress being made by our local partners for clean water! Thank you for your gifts and prayers, and for the part you’re playing in this process! 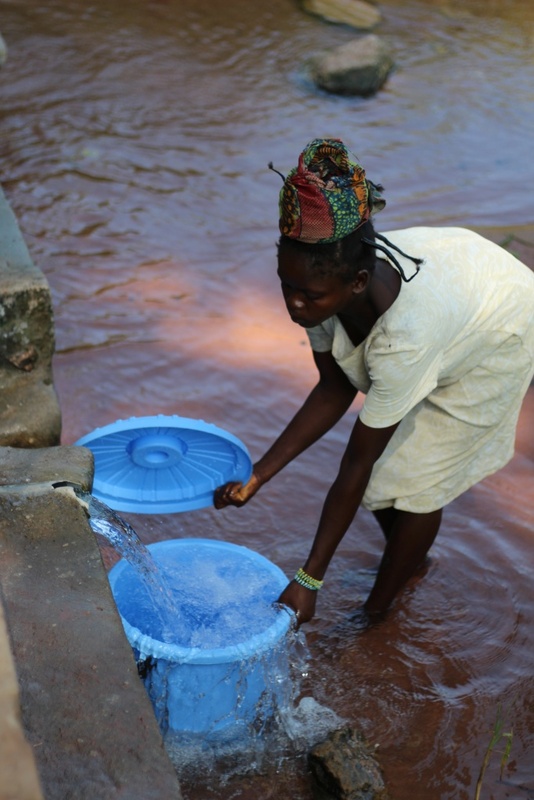 Please consider donating to the Congo Clinic Initiative to support clean water projects in local communities in Congo. After women showed the men where their drinking water comes from, they understood the need for clean water. PCP helped bring in a local water technician to assess the situation and help develop solutions with the community. Spring capping is one way to provide clean water to communities and clinics. Posted in Congo Clinic Initiative, Congo health, PCP Update.